ARM boxes are guaranteed for the life of the contract. 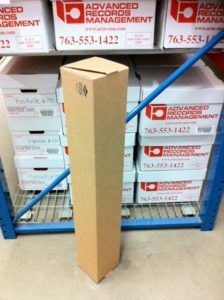 Our standard record storage box is 12” x 15” x 10” tall. Our drawing box is 6” x 6” x 40” tall. "Thanks—I must say you (and Ryan) give some of the best service ever!" "I would like to leave an e-Comment Card for Mr. Mike MacDonald. During the past nine months of my employment as the new Receptionist/Administrative Assistant at XXXX, Inc., I have had the wonderful privilege to meet Mr. MacDonald. His brief visits to drop off blank tape cartridges, as well as pick up any outgoing tape cartridges, have been so very pleasant, welcoming and professional! We welcome him anytime, and want to express our appreciation for his courteous and continued customer service!" "I’d like to pass on a positive comment about Kev and Adam: They did GREAT work this week. They worked hard, efficiently, and professionally and they did the work with a positive attitude. They communicated with me throughout the week superbly and they always let me know the process and their work schedule. I am very picky when it comes to choosing companies to do business with and my expectations on service and product are very high. I expect a lot (ask my children…or better yet, my wife!). Kev and Adam met my standards and I’m very glad we hired your company. I did express my gratitude to Adam and Kev but I wanted to let you know of how things went this week. Kevin and Adam are great people. As a new customer of yours, my experience so far has been extremely positive." "I want to thank Ryan from ARM for his fast, professional, and courteous emergency assistance that he provided. It is much appreciated. Thank you!" "Every person I have ever worked with at ARM has been so very helpful and genuinely kind! Every delivery person, Laurie, yourself – that is such a great thing to see and work with in this day and age, as it is getting more and more rare! Thank you again, Jeff, for having a great company and making my life easier here in Document Control! Have a great summer!" "Just want to pass along my appreciation for you and your team’s perseverance and responsiveness during these last two weeks. It’s been such a relief to have such a dependable partner in migrating our Mainframe tapes from Dallas to Minneapolis. Thanks again." "We’ve had a real good run with you for several years. It was one of my best decisions since I’ve been here." "Seriously Jeff, I think your company is terrific and has great quality service which is at the top of my list when dealing with vendors. This is more important than cost and location." 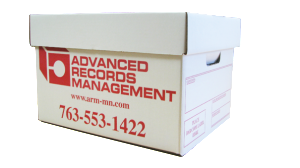 "Thanks to each member of the Advance Records Management team for another year of friendly and prompt customer service, tender loving care of our boxes, and going the extra mile to ensure our experience is a great one! All that and you send me treats!? Wow. It’s like getting extra whipped cream in my hot cocoa--thank you!! Wishing each of you a very Merry Christmas and Happy New Year!" Copyright © 2019 Advanced Records Management. All rights reserved.